If you’re visiting Melbourne for the first time, you’ll be wanting to see the National Gallery of Victoria, and you’ll probably take in the Botanical Gardens, the café culture and the Queen Victoria Market – there’s a lot to see and do in this beautiful city. However, you may not have heard of the treasure that basks just a mere hour to the North East. Here lays the wine country known as the Yarra Valley. Wine has been grown in Victoria since the 1830s, but for many years it was the state’s best-kept secret. Recent decades, however, have seen an appreciation by the world of Australia’s rich wine heritage, and in particular of the pinots, chardonnays and sparkling wines produced in the temperate climate of the Yarra Valley. No visit to Melbourne is complete without a tour to the wineries of the Yarra Valley. 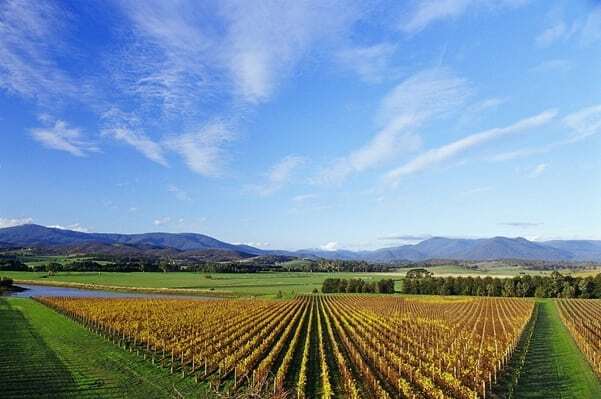 Australian Wine Tour Co offers visitors to Melbourne Day Tours to the Yarra Valley wineries, providing a personalised and convivial experience which includes guided tasting. The Yarra Valley is stunningly beautiful at all times of the year. While the key to the quality of its wines is its temperate climate, it has an unusually high incidence of crystal clear blue skies, dazzling colours in autumn, and a cozy atmosphere in winter. The Yarra Valley’s success as a wine growing region led to a demand for fine food to entertain its visitors. Today the region has some of the state’s preeminent restaurants, and produces fine food of all kinds – bread, salmon, trout, cheeses and jams, fresh fruit and vegetables. Our wine tours from Melbourne feature visits to a diverse selection of the over 100 wineries the Valley now boasts. You’ll taste wines at the cellar door, under the guidance of an expert who hasn’t forgotten that the purpose of wine is “to gladden the heart of man”. in addition to the wine, you’ll sample a fantastic variety of food that the Yarra Valley has to offer, as well as a delicious lunch. Transport to the Yarra Valley is by our luxurious tour bus; it has a maximum capacity of 24, but we preserve the conviviality and intimacy of our tours, so usually you’ll find yourself in a group of around 12-20. Our Melbourne wine tours to the Yarra Valley includes pick up from three convenient points in the CBD. A Yarra Valley day tour isn’t just about eating fine food and drinking fine wine. If you can tear yourself away from the cellar door, there’s hot air ballooning, walking, cycling and golf. And the Valley boats a string of galleries selling fine art and craft work. A Yarra Valley wine tour will give you more than just wonderful memories to complement your visit to Melbourne. You’ll come away with cellar door purchases that you’ll be enjoying in many years to come, and maybe even a work of art from an undiscovered master!